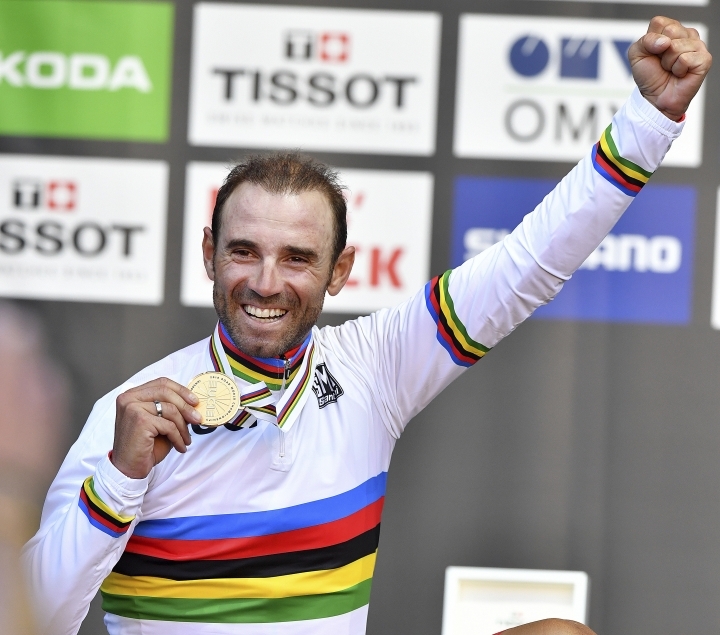 INNSBRUCK, Austria — For the seventh time in his career, Alejandro Valverde stepped onto the podium after the men's road race at the world championships on Sunday. But for the first time he received the gold medal. The Spanish rider sprinted to his first world title after a grueling, mountainous race of 6 hours, 46 minutes through the Austrian Alps, including a final climb with a maximum gradient of 28 percent. 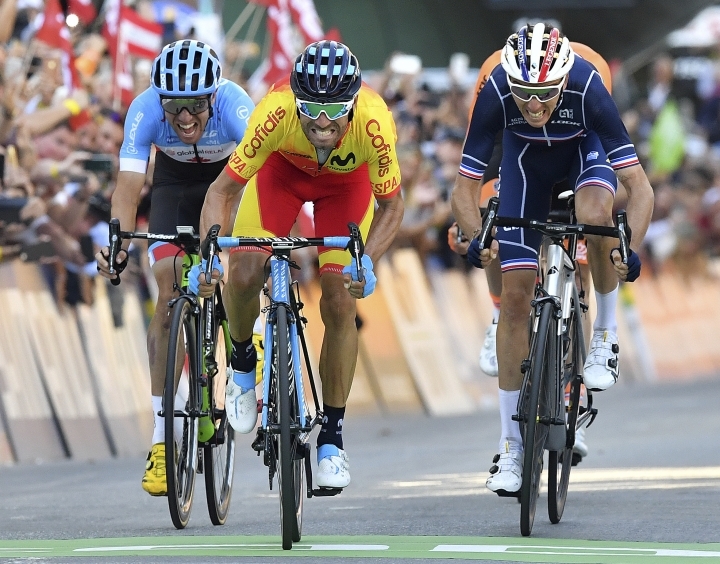 Valverde led a group of four in the final kilometer, and he just remained ahead in the sprint, with Romain Bardet of France taking the silver. 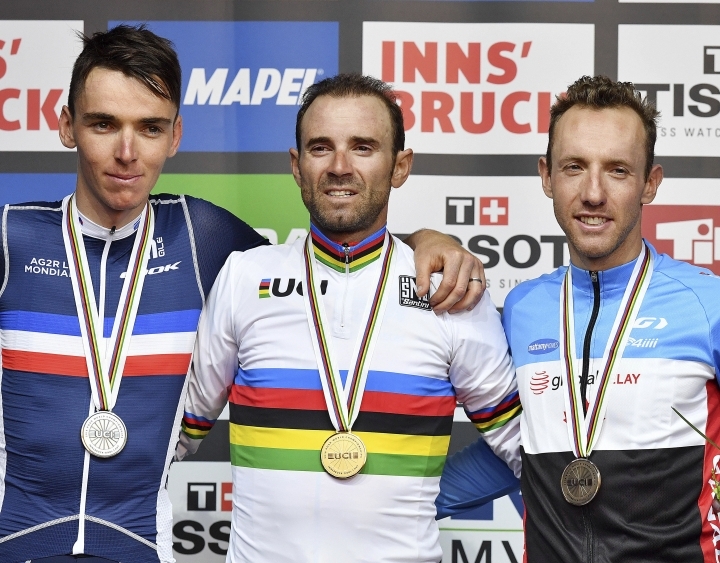 Michael Woods, the first Canadian in the top three since Steve Bauer in 1984, won the bronze, while Tom Dumoulin of the Netherlands placed fourth. The victory came 15 years after Valverde won silver in Hamilton, Canada, a feat he repeated in 2005 in Madrid. He also came third four times, in 2006 and three years in a row from 2012-14. "This is the greatest day of my career. 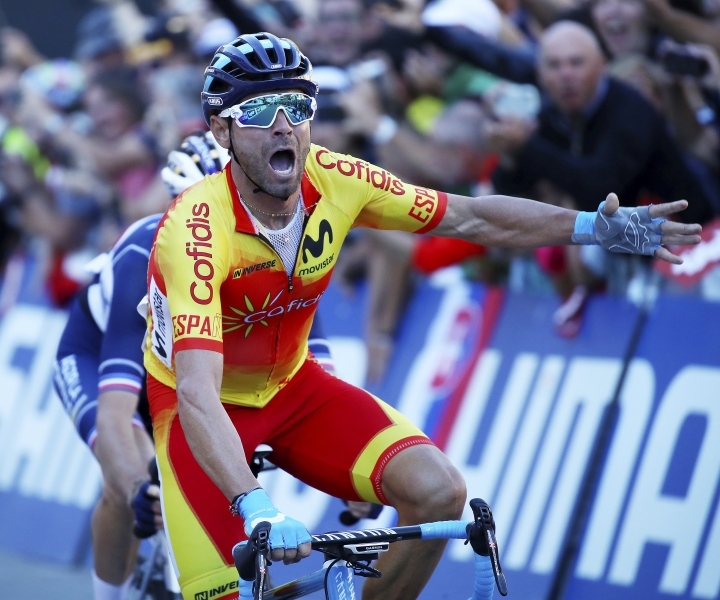 It means everything to me to take this victory," the 38-year-old Valverde said. "It's my biggest pro victory. One that I've fought hard to achieve for all these years. Something I've been chasing for during my entire career." Valverde, who served a doping suspension earlier in his career, has won stages in all Grand Tours and was the overall winner of the Vuelta in 2009. Sunday's title came a year after he suffered a fractured kneecap in a fall in the Tour de France, forcing him to end his 2017 season prematurely. "I'm so proud of wearing this jersey for the next 12 months," he said. "I've been at other world championships where a teammate won and I enjoyed it, but taking it yourself is just special." Valverde positioned himself for the win when he went ahead of the pack together with Bardet and Woods for the final five kilometers. While the trio built a lead of a half-minute, Dumoulin managed to catch up for the last 1,500 meters. Peter Sagan had his three-year winning streak snapped when he quit the race with 90 kilometers left. The Slovakian sprint specialist struggled on the 258-kilometer course, which included 4,681 meters of climbing and was regarded as one of the toughest world championship courses in decades. Many of the pre-race favorites had problems, while Warren Barguil of France and Primoz Roglic of Slovenia were among the contenders slowed by crashes. A group of 11 riders broke away in the opening kilometers, and as there were no title favorites among them, the peloton wasn't bothered about chasing them for most of the race. The group was allowed to build a lead of up to 19 minutes, but was gradually reduced as more and more riders couldn't keep up with its pace. It left Kasper Asgreen of Denmark and Vegard Stake Laengen of Norway as the two leaders, but they were finally overtaken by the peloton with 20 kilometers left to go. Several riders tried to attack, and Asgreen's Danish teammate Michael Valgren looked successful for a while as he went 30 seconds ahead. The French team, however, closed the gap in an attempt to set up Bardet, but they also helped Valverde and Woods to the front. "There's some time left for me before retiring," he said. "But with such a victory, I can already leave this sport happy."